Wednesday 5th February 2014, 6:30 pm. 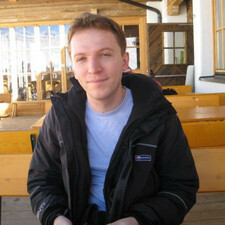 Speaker: Colin Gravill, Microsoft Research Cambridge. Cells are the building blocks of all life. If we could program living cells as effectively as we program digital computers, we could make fundamental breakthroughs in the treatment of disease and the development of sustainable agriculture, while also gaining insight into the workings of life itself. In spite of this promise there are still many challenges to overcome. First and foremost, programming cells remains highly complex and error-prone, and we have reached a point where powerful computer software is needed to accelerate further progress. This session presents our web-based software for programming cells including molecular circuits and genetic computation devices. We present a molecular program of an optimal consensus algorithm and show results of the working system compiled into DNA. The session demonstrates a software tool chain for characterising genetic parts that can be combined into genetic devices for programming cell function. Just as software for programming digital computers heralded a new era of technology, software for programming cells could enable new applications of biotechnology.